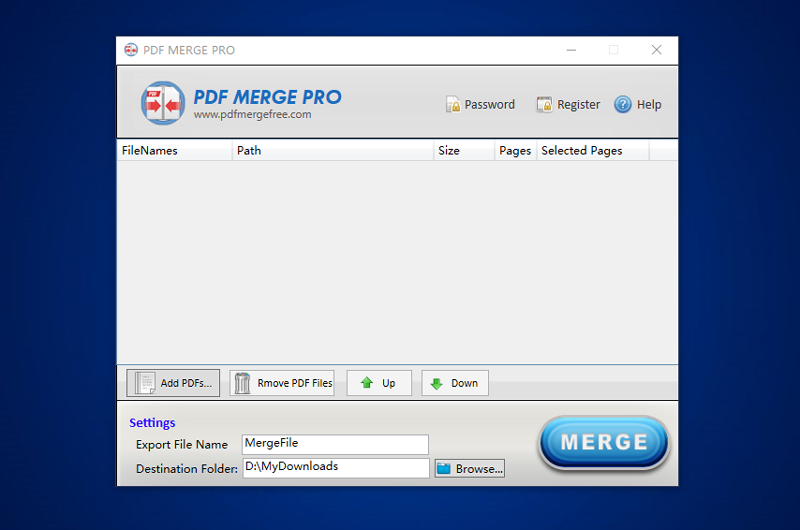 After an uneventful installation, the PDF Merge Pro will prompt you with its main window, where all your interaction with the tool will happen. The GUI of our application is simplistic and has a modern feel to it, and no obstacles whatsoever should be experienced when using the application. As for the way the program works, things are quite clear-cut. You only need to click the €Add PDF Files€ button, which lets you browse for your documents and prepare them for the modifications they will undergo. Once you have settled on the PDFs you want to merge, the program will list them all along with their number of pages and path so that you can easily recognize and properly organize them. And since we have mentioned this aspect, you may want to know that you need not worry about the order in which you select your PDF documents since the program enables you to rearrange them using the up and down arrows. What€s more, a button helping you delete any entry is close at hand. At this point, all that€s left to do is hit the €Merge€ button, and you€re good to go, with your output PDF, comprising all the previously selected ones, being saved to a location of your choice. This page was last modified on 13 April 2018, at 17:28.